Or to find out more about CEO coaching in Texas or elsewhere. As coaches, we help CEOs have more fun and make more money. Here is our no-risk coaching offer. Set up a FREE 30-minute appointment with me. Allow us to learn a bit about you and your business, and let’s go to work. No sales pitch. Let’s get to work. If after the appointment you think it was valuable, you gained insight, learned something new, want to continue – we’ll sign you up and schedule another meeting. If not, we shake hands and walk away friends. We work together as long as both of us find it beneficial. You can fire us at any time for any reason. And we will exercise the same right with you (although for me it is because we are not a good fit or I sense I care more about your business than you do). Seems fair. Seems right. The honest way to work. and a strong coxswain to guide them. One thing I wish I had figured out a long time ago was the value of having a coach. Like him or no, Tom Brady, one of the best quarterbacks in football history, has a coach. I currently utilize about four coaches and one of the best I’ve seen is Keith Okano. Keith and I have been working together for about six months. He has a way of asking great questions that get my mind thinking in the right direction which then leads to me asking him great questions. He is not afraid to tell me when he disagrees with what I’m doing – which is what I need. I am proud to recommend Keith as a business coach. Let him inspire you the way he has me. Some people look at coaching as a luxury but I truly believe it is a necessity for the Owners of businesses of any size. As owners, it is easy to get in your own head and lose focus of goals. Keith has helped get my financials dashboard in order, understand the worth of my business and my value in the business equation. I am taking the steps to become an owner instead of being an operator. As a small business, I rely on my mentor as a sounding board. Insight from an outside party helps give, ideas as well as problems, perspective, create solutions and define goals. The value of a good Mentor/Coach goes beyond the initial monetary cost and translates directly to the bottom line. "It is a true pleasure to highly recommend Keith Okano! Keith is a true professional in the way he goes about his business. I have sat in on a few meetings on Leadership which he has directed. I took many notes and his people skills are outstanding. He is one of those guys when you meet him you feel like you have known him forever. Once again it is an honor to recommend Keith in whatever venture he is involved in." 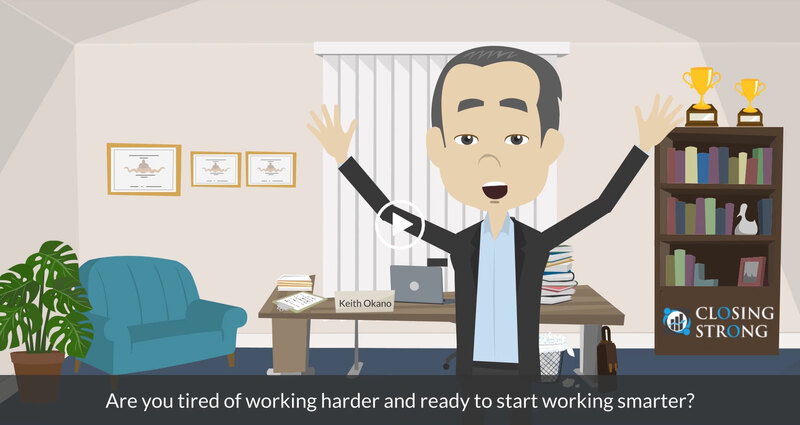 "Keith Okano is a true business person's coach. If you are interested in taking your business to the next level, it is time to invest in yourself and hire Keith! His strategies and methodologies are uniquely designed for you and tailored to meet your specific growth plan. As the facilitator of Silver Fox CEO Roundtable discussions Keith allows the meetings to flow and gently keeps us on track and incredibly productive. Do yourself a favor and contact Keith now to see how he can serve your needs."